Abby is six months now and getting sweeter by the day. She went to the vet today to get spay. A bit tired and worn, she came out with the cone so she wouldn’t open up the wound. It takes a while to get used to it. A few stumbles and underestimating the width of the cone, she hit a few walls. And then she figured it out. 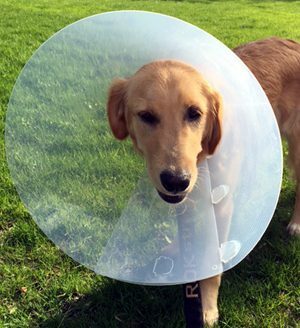 Nope, when you have the cone on, you keep your head up, rapt with attention and mighty aware of all that is in right now, here in front of us. Next invention! Cones for humans.